Home The Adventure Bolivia Another Lagoon, Anyone? It started rather ominously. Julia had gotten into the back of the car and was having a, rather heated, debate with the lady running La Torre tours. Esteban, Miguel and I were stood outside rather awkwardly, not knowing what was really going on. Neither do you I’d guess, so I’ll start from the beginning. Close to Tupiza it’s still a spiky, dramatic landscape. 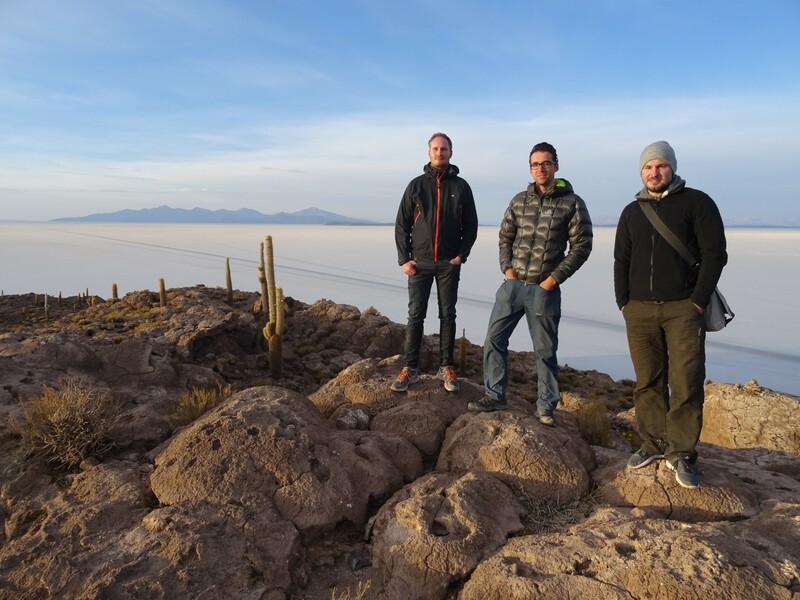 Julia, Esteban (real name: Stephan) and Miguel (real name: Michel) were my group for the salt flat tour. I’d seen Julia at the hostel briefly, but other than that we were all strangers. Apart from Esteban & Miguel. They were travel buddies. Special ones. The crew on the second day. My hair doing its best Wolverine impression. The debate began as Julia got in the back of the 4×4 to find no space in the back. Actually really none. The description we’d all been given when we booked the trip was that while the driver/guide and cook would be in the front, two would be sat in the middle and two in the rear, allowing each passenger a window. The majority of the trip is in the car, so this and the extra space is why you pay more to only have four on the trip as opposed to five. This seating arrangement was not possible, the vehicle seemingly smaller than others – the only option would be three in the middle and one sat sideways, cramped in the back. The other bone of contention was that Miguel and Esteban had prebooked to get an English speaking guide, as they had no Spanish, but on turning up had been told he wasn’t available. They took the disappointment well, even if obviously annoyed. As I said, it started rather ominously. 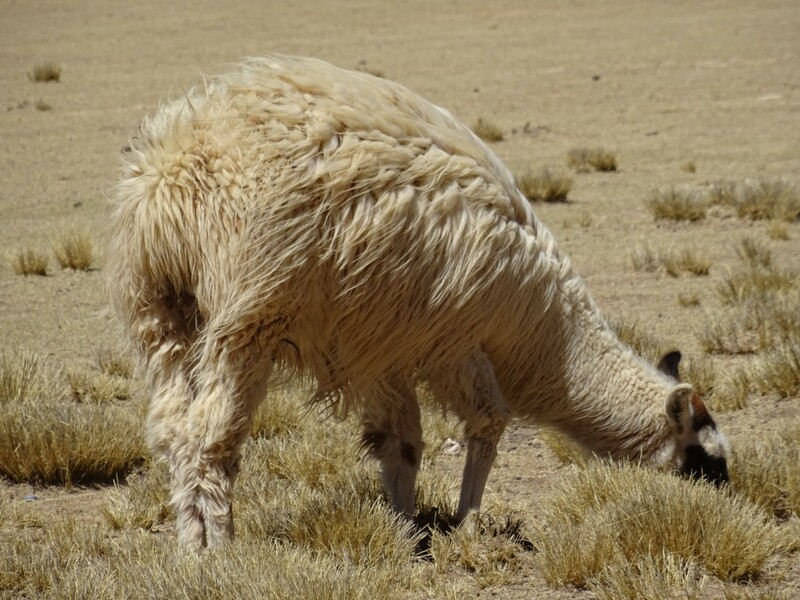 First sighting of the lesser spotted llama. The first day continued in a rather similar fashion. Our driver had said we would not get much time for stops to take a look at he amazing scenery, but we weren’t prepared for just how little. Leaving at 8:30AM, we stopped maybe four times, with a total out of the car time probably less than an hour. This on a journey that took till 7PM. We understood that the schedule was not the Luis’ (the driver) decision, but if he was guilty of anything it was lack of communication, even in Spanish, combined with excessive bluntness. That and a complete lack of enthusiasm. Each stop would be accompanied by “Diez minutos, no mas!”, resulting in calls of “Vamos chicos!” minutes later. That was it for communication. No mas. Pre-Inca Ruins on the first day. It certainly wasn’t all bad that first day, though. 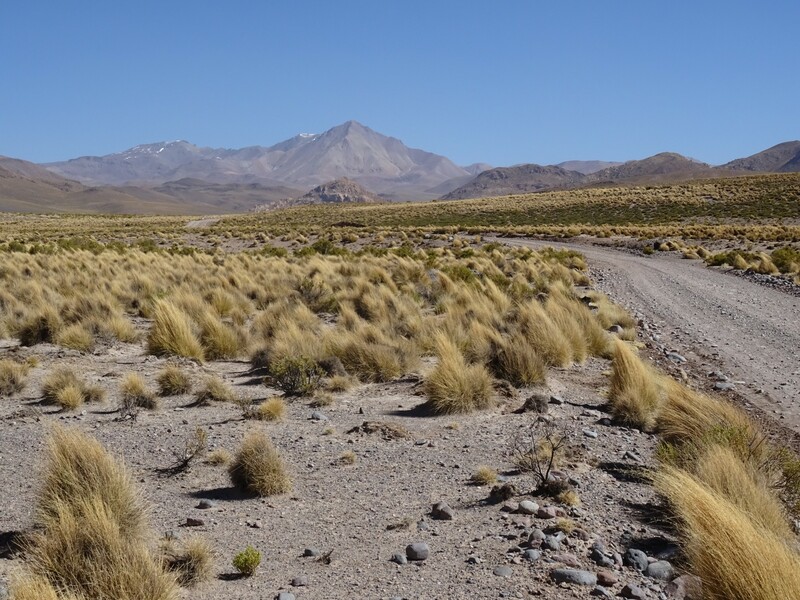 As the elevation increased to well over 4000m, the rocky Tupiza became an endless moorland, complete with plateaus, ridges and rolling hills. 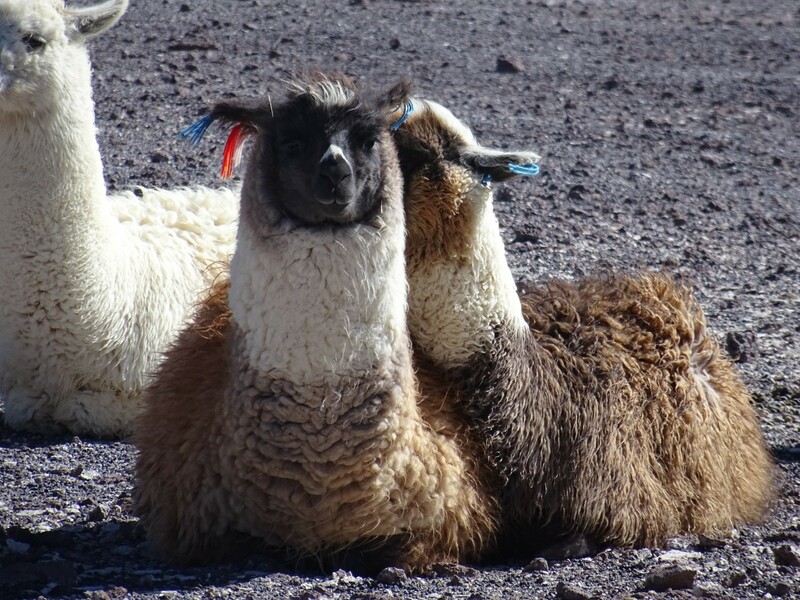 Llamas roamed the grassland, shaggy coats blowing wildly in the wind, and posters of boybands were found in the unlikeliest of remote locations. 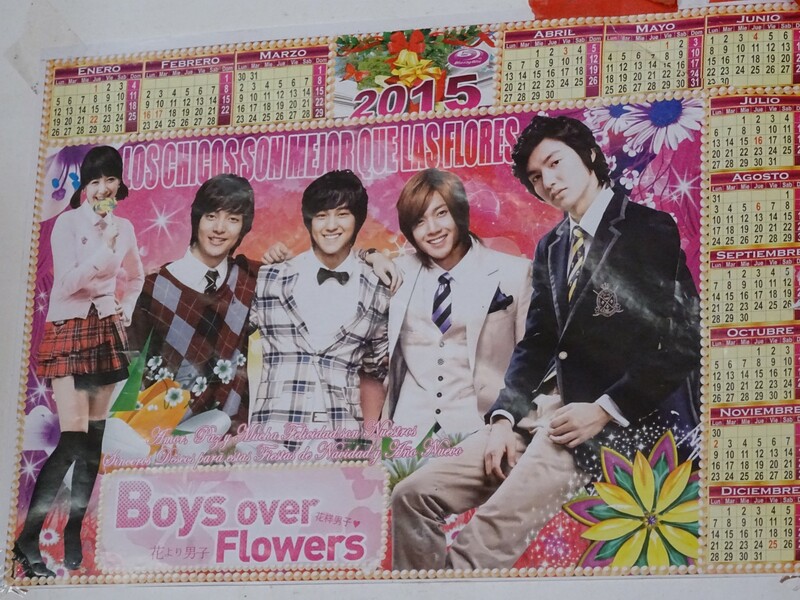 One Direction eat your heart out – Boys Over Flowers have arrived! The wind was strong that first day, just like the moors around the Peak District, but our driver had an unconventional method of protecting his windscreen from incoming projectiles. A plastic sheet. Taped to the windscreen, this advanced bit of technology was apparently an effective protection mechanism, with only the one, obviously unimportant, side effect of preventing all vision through said windscreen. 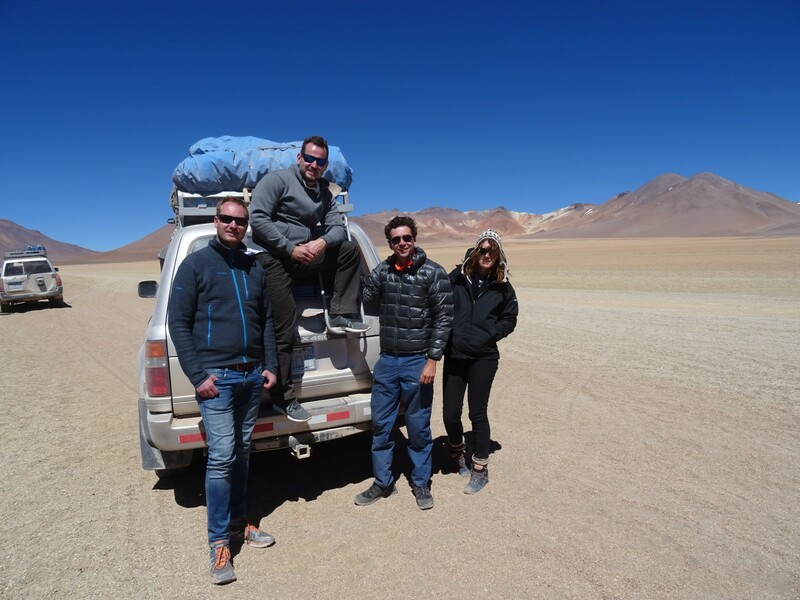 As passengers, we would have quite liked the driver to be able to see the windy, narrow road, but in Bolivia not all luxuries are so available. 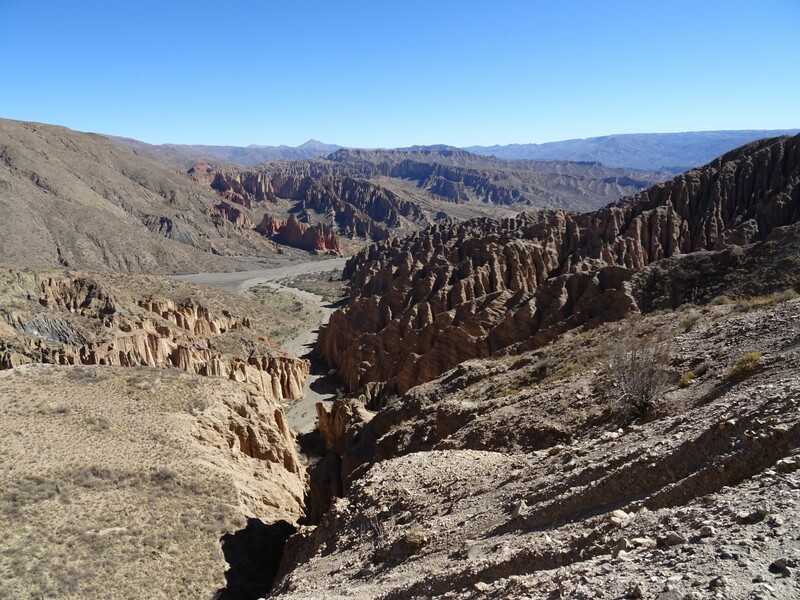 Our longest stop was probably at he pre-Inca ruins, set into the valley below a mountain. Remarkably well preserved, the remnants (mostly low walls) swarm at the mountain base, while the Spanish church, obviously built later, stands tall in the centre. Still decrepit, but taller than rest. After this, the day grew to a close. A quick stop to buy tickets for entry to the national park preferred arrival at the remote refugio. 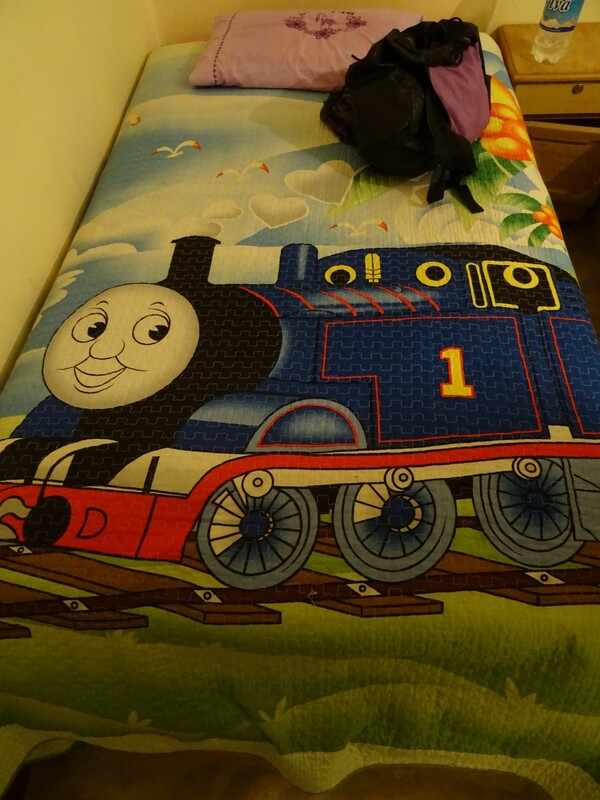 The world’s most awesome bedsheets awaited. Reminds me off my wallpaper. When I was young, obviously. Not now. Really. Our second day began with a bit more promise – apparently we were going to stop more often! We began with a surprise stop to see some ostriches in the distance and knew from there it was going to be good. 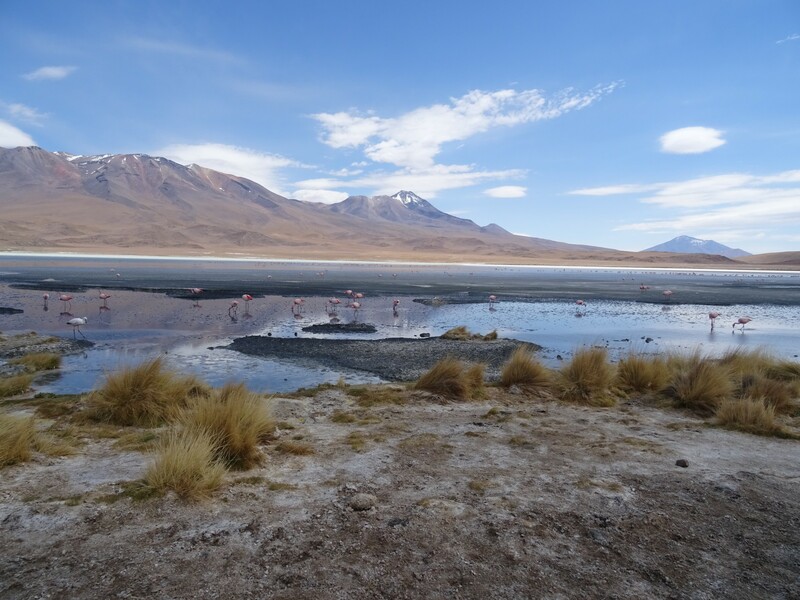 The first real stop was for flamingos on a lake. It was awesome, despite them being so far away, and our zoomed in as far as possible pictures were the highlight so far. 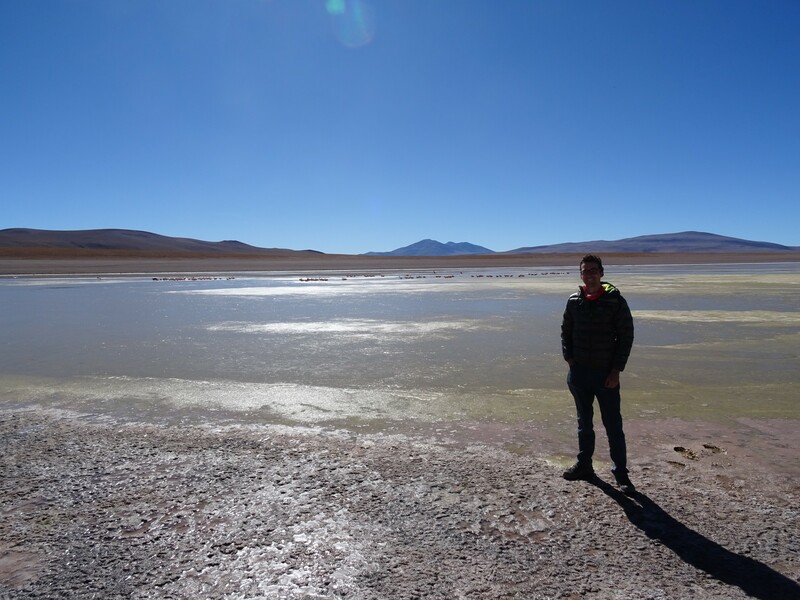 After a few more lagoons, each slightly different, we drove through a desert like area, complete with giant rocks spewed out by a nearby volcano (as in only a few miles away) and arrived at the Laguna Verde. As named, this is an amazingly green, crystal clear lake, set at the base of a volcano. Not that they restricted themselves to one place, but Miguel and Esteban probably took more pictures of each other here than anywhere else. Preening and posing, species were in abundance. 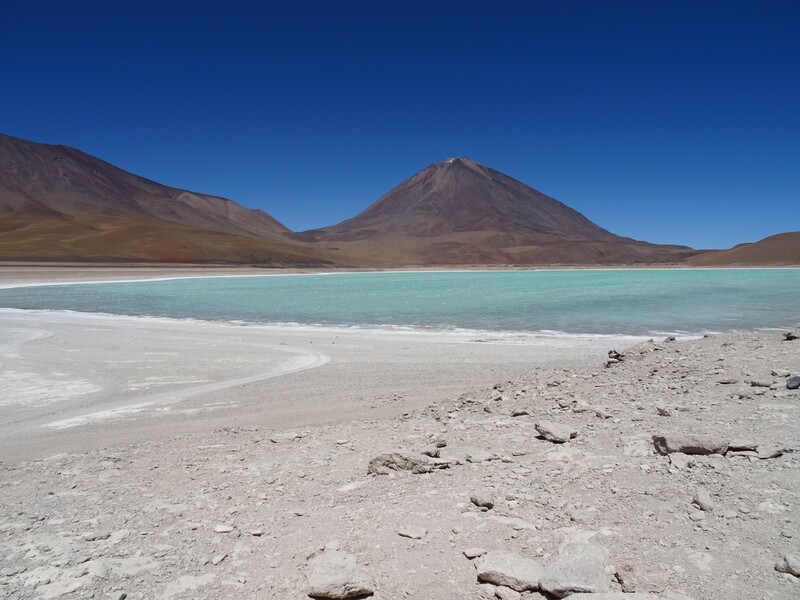 Laguna Verde. Miguel and Esteban not in sight. Backtracking on ourselves, we ate lunch next to a hot spring site. 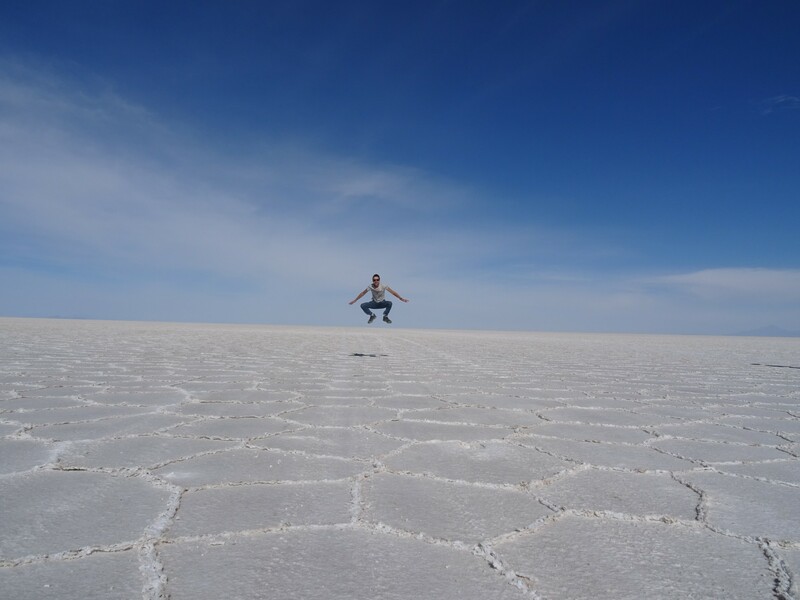 We’d now gotten onto the path that the tours from Uyuni also take, so arriving there the spring was chock full of other tourists. Fortunately, after eating lunch we had it almost to ourselves, the gentle warmth soothing our wind ravaged bodies. We also took some time to check out some geysers. They weren’t the erupting kind, which would have been awesome, but just bubbled with explosive intent, as if to threaten that one day they would. 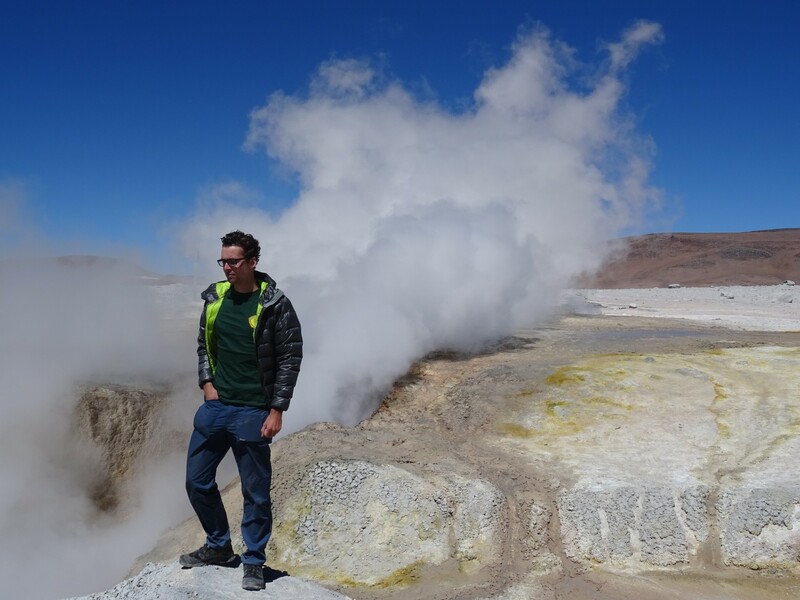 Steam poured out and sulphur was thick in the air as we jumped around, trying to get the best view. Looking away from the camera. Smooth. 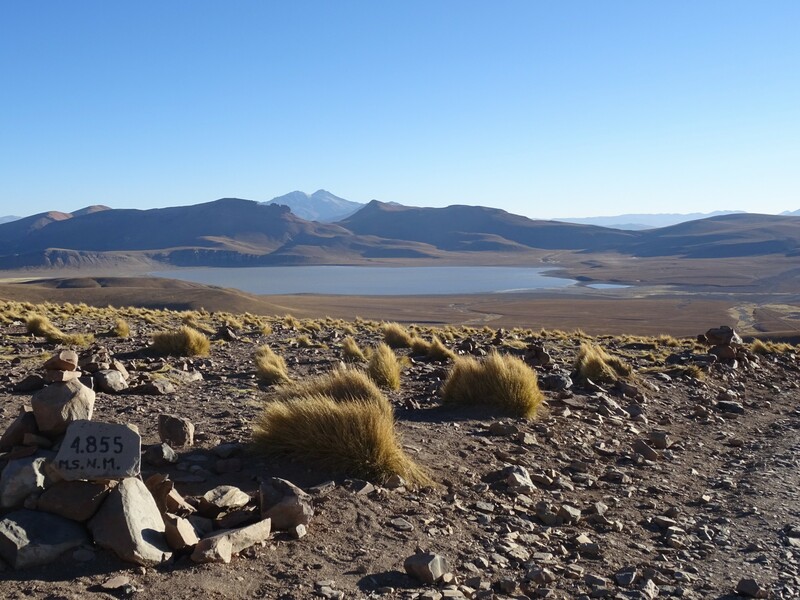 At the end of the day we reached the Laguna Colorado. 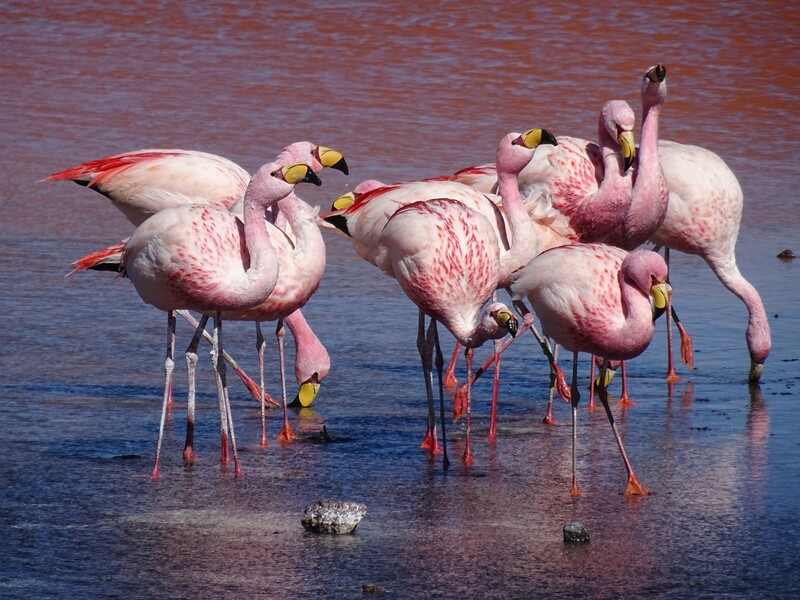 This amazing deep red lake is home to thousands of flamingos which had a bravery unknown to those we had seen before. As we stood on the shore, they grazed on the lake a mere 10 metres from us, totally nonplussed. It’s hard to believe how close we were, and how many amazing pictures we were able to take. That was until the photographers arrived. Sporting humongous cameras (compensating for something? 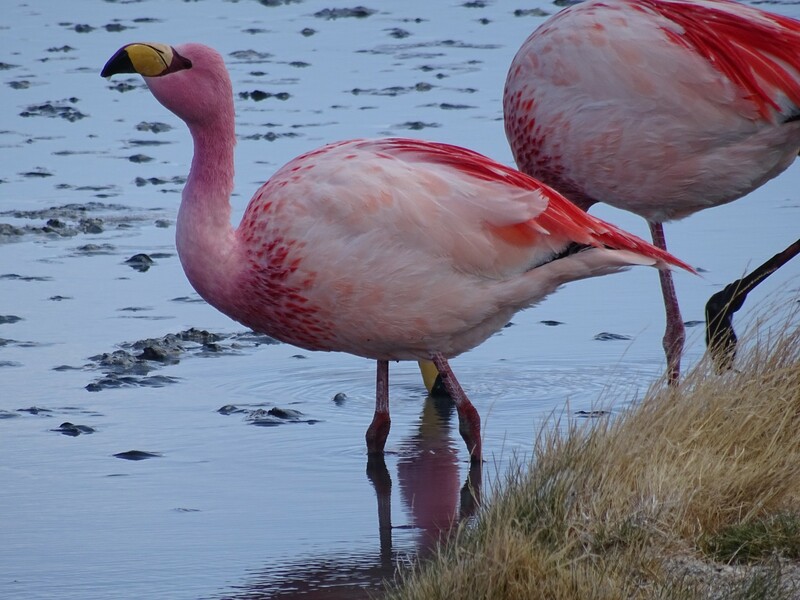 ), they clicked and snapped, causing a few flamingos to drift away. One of the photographers didn’t take kindly, shouting at us in our closer position to get back. 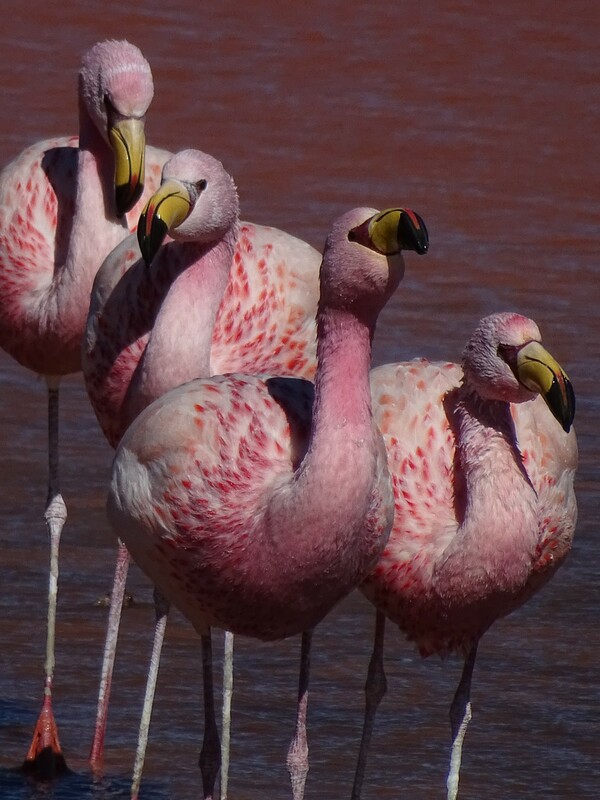 Despite their new arrival and comparative noise, it was obviously us scaring the flamingos. Shouting be damned, he would let us know. He even took pictures of us in his fury. We were quaking in our boots. After ignoring him for a while, and seeing some more llamas (which was still awesome; everyone loves llamas! ), we drove to the refugio and settled down for the evening. We’d heard that there would be wine on the last evening, and since Esteban and Miguel had brought a copious amount of German named Bolivian wine (Kohlberg) we spent the evening working our way through the three bottles that hadn’t been drink the night before. To Julia’s dismay, this only increased the number of our stupid jokes. Apparently being the only girl compared to three guys in the group was traumatic. We spread the love with the other La Torre tours group, playing cards for the rest of the night with the traditional Bond Girls set. With wine and cards, time flew by and despite the night time cold (my sleeping bag was blatantly designed for five feet Bolivians) we were raring to go in the morning. More flamingos on day three. Seriously, I have about 400 pictures of them! The day began quietly. We drifted through a desert of Martian views, dry windswept landscapes as quiet as the real thing. With the groups silence I put in my earphones and started listening to Mars: The Bringer of War. Just as it reached crescendo, we drove between a series of monolithic structures. The kind you’d expect if you found evidence of some hidden civilisation on Mars. The awesome kind. 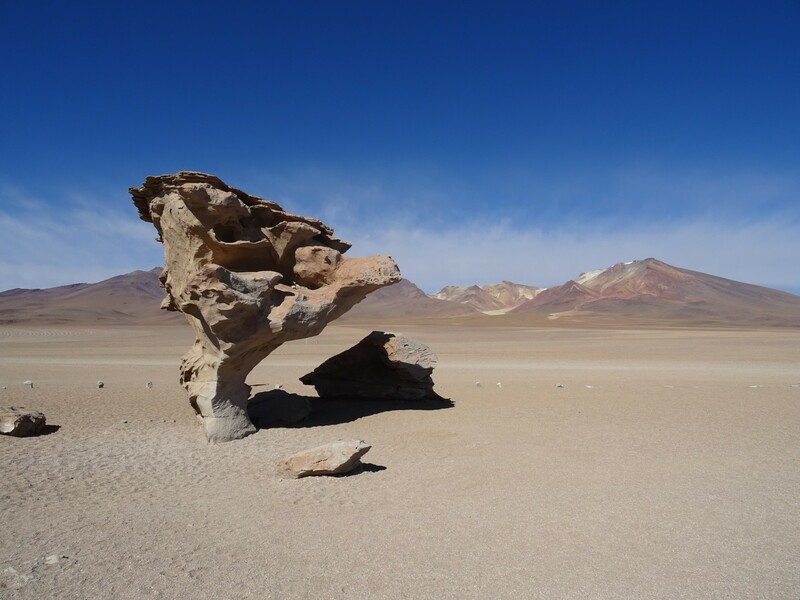 While the ‘Arbor’, or tree, is the the main attraction, the formation and remoteness of them all was amazing. They were also great fun to climb. From the top you could see the whole valley around, mountains looking like paintings in the distance. It was another planet. This is probably as close as I’ll get to Mars. For the rest of the day we spent our time hopping from lake to lagoon and lago to laguna. They were everywhere. 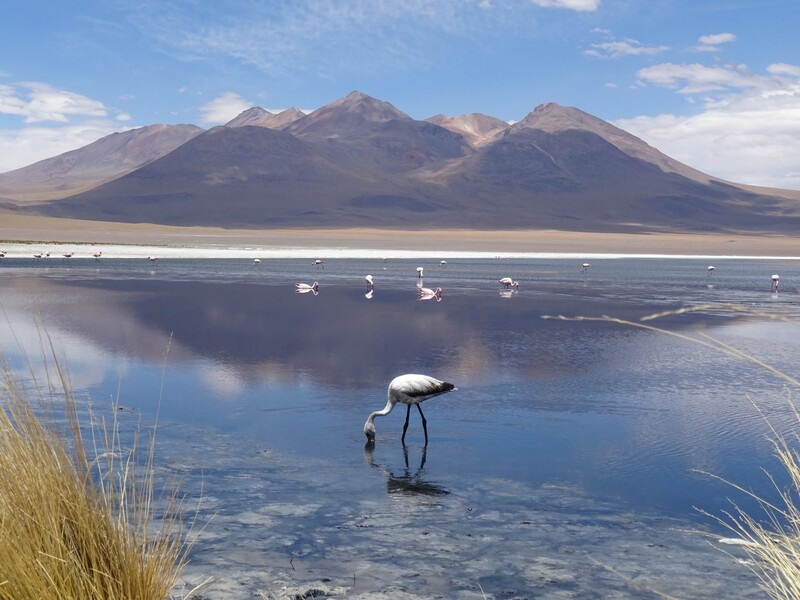 With each, the flamingos would be closer and more docile than ever, culminating in some of the most awesome views of flamingos ever. 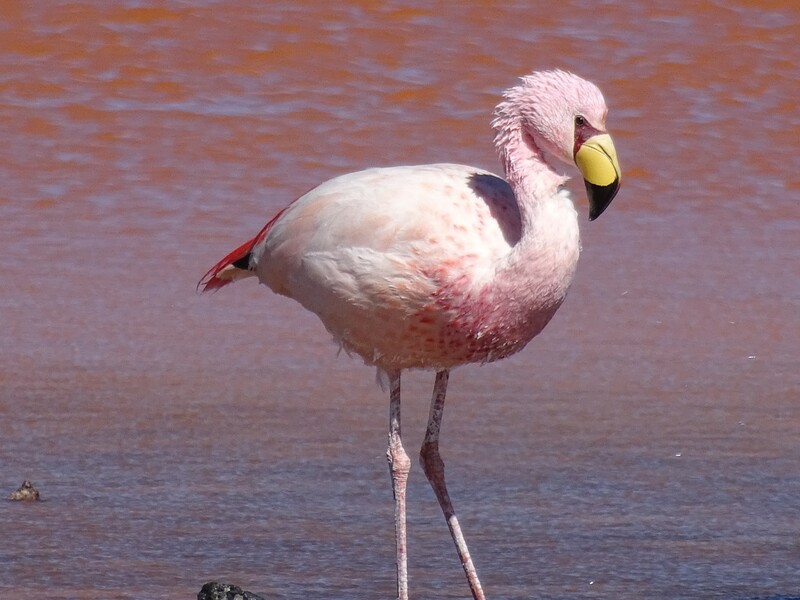 Only after you believe you could not possibly take another picture, or look at another flamingo or lagoon, does it end. 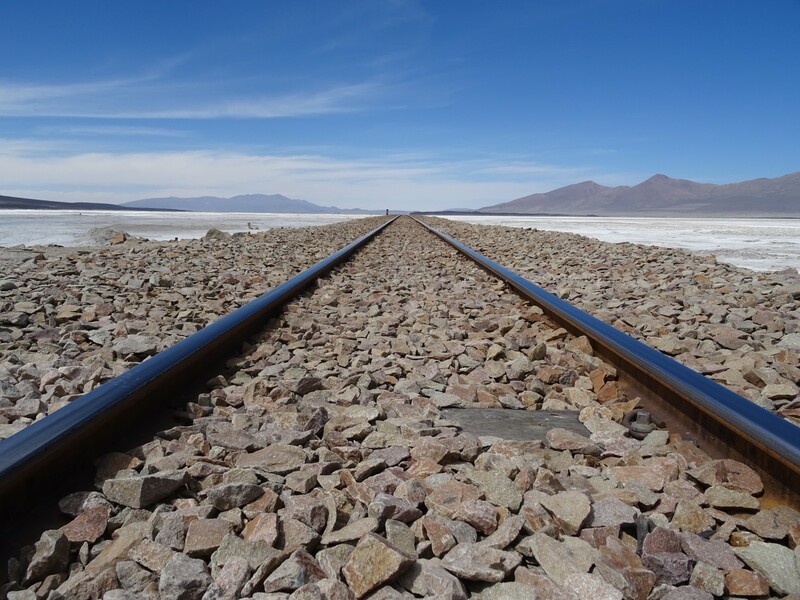 Crossing a small salt flat, the last stop was the cargo bearing rail track running through the centre. 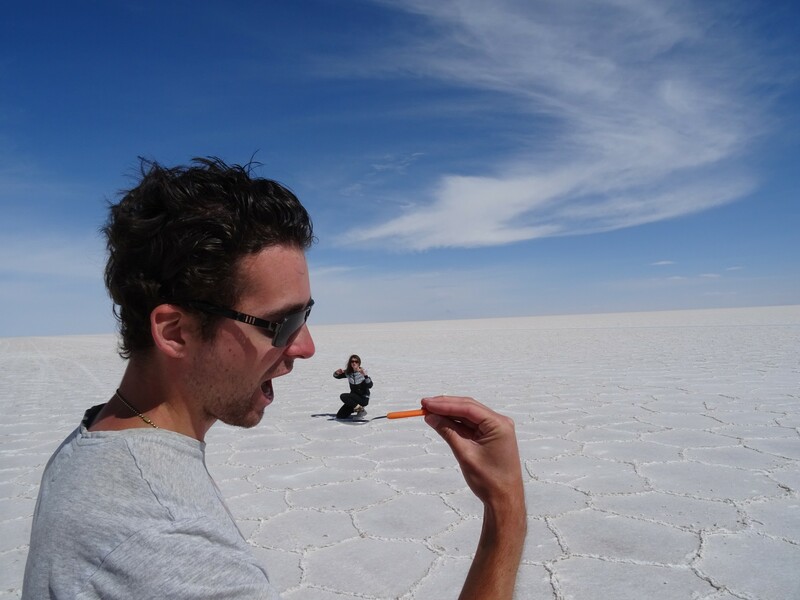 Bisecting the flat perfectly, it provided the perfect place for Esteban and Miguel to perfect some more selfies – the background second to an incredible appetite to see themselves. 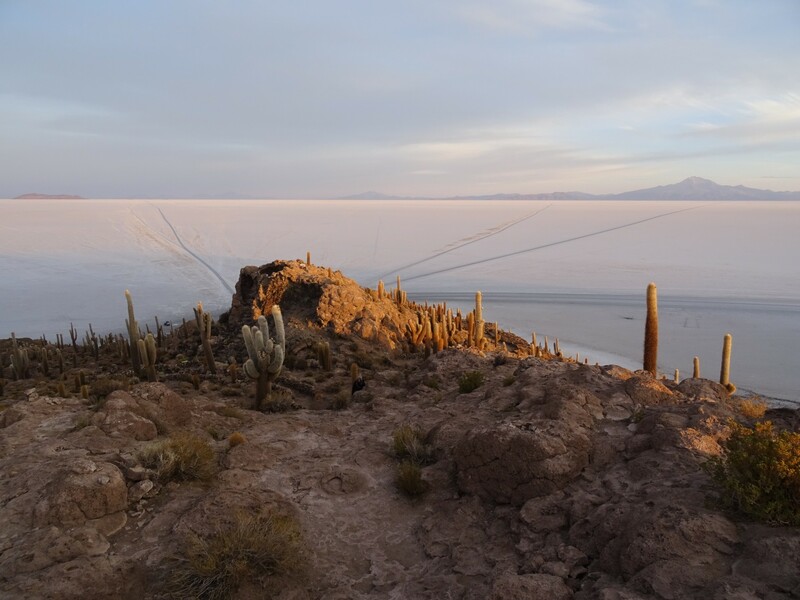 Staying in a salt hotel for the night, the only question afterward was whether we would get the rumoured lasagna, which we had discussed so much over the past few days. Or maybe we would get llama burger, an undying dream we had all been searching for the answer to. It turned out we would get lasagna, and though not quite homemade standard it was quite a welcome relief from the soup we’d been on the past few days. Of more immediate importance though, was a shower. Or more precisely, a hot shower. No one having had one since Tupiza, there was a large queue. A long queue too, since eight minutes were permitted per shower and almost everyone took full advantage. 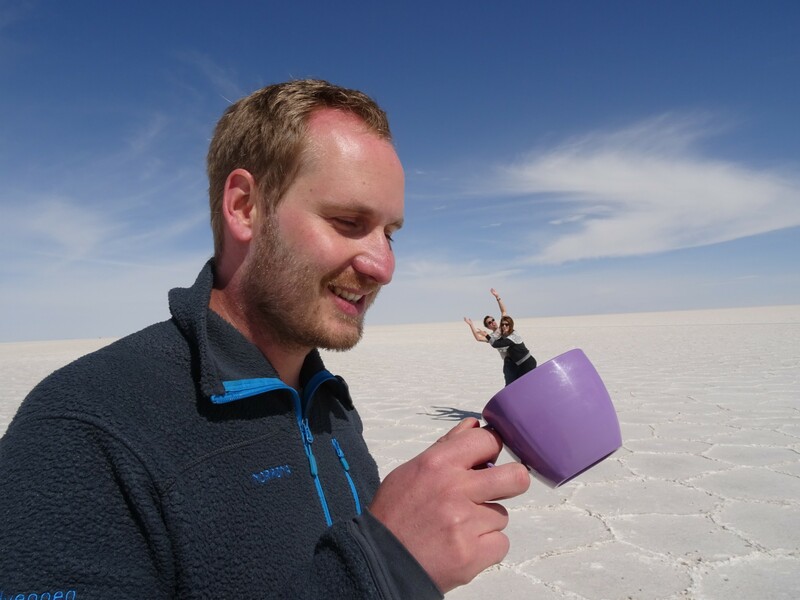 We were all up extra early the next morning, half four, to get to the salt flat for sunrise. After a pitch black drive straight across the salt, for once not bumping up and down like a jackhammer, we reached Cactus Island. It’s basically just a small rocky hill, in the middle of the barren plain, totally covered in cacti. We trudged to the top, chill wind biting, watching the sun rise as we got nearer to the peak. ‘Cactus Island’. Sound like is should be in the Monkey Island games. The sun peeled over the horizon, slowly lighting up cacti and revealing the flats all around. In the distance, mountains sat as guardians to this inner world of white. A complete panorama, those there just watched as time slowed to a crawl. Joining in with one of Miguel & Esteban’s poses. After descending to the flat once more, we ate breakfast, but not before Miguel and Esteban’s dreams came true. Taking a gander at the shop (its touristy here, OK?!) there was a whole selection of toy dinosaurs waiting to be bought. 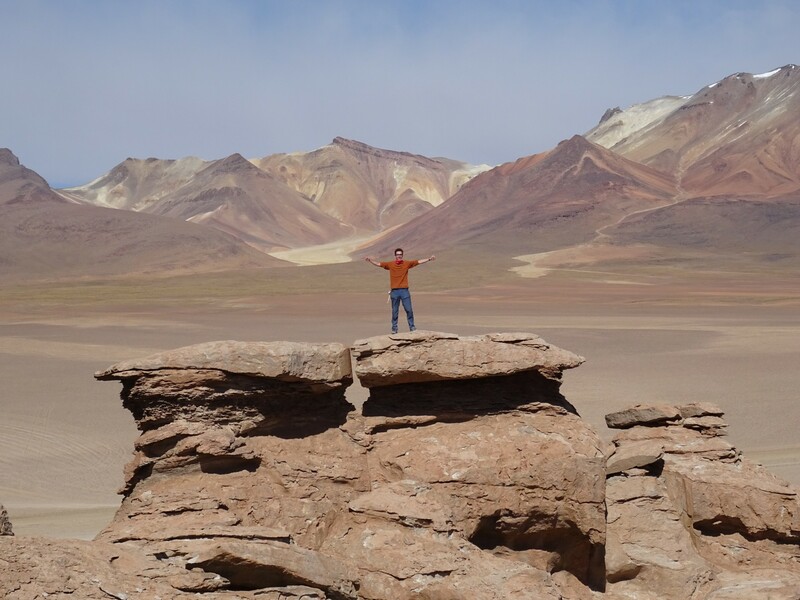 Miguel and Esteban had been looking for one to use for pictures on the forthcoming flat, but despite offering a Bolivian woman over 50 bolivianos for hers, they had been unsuccessful. No wish had been greater, other than perhaps that of the llama burger. The dinosaur performed admirably. 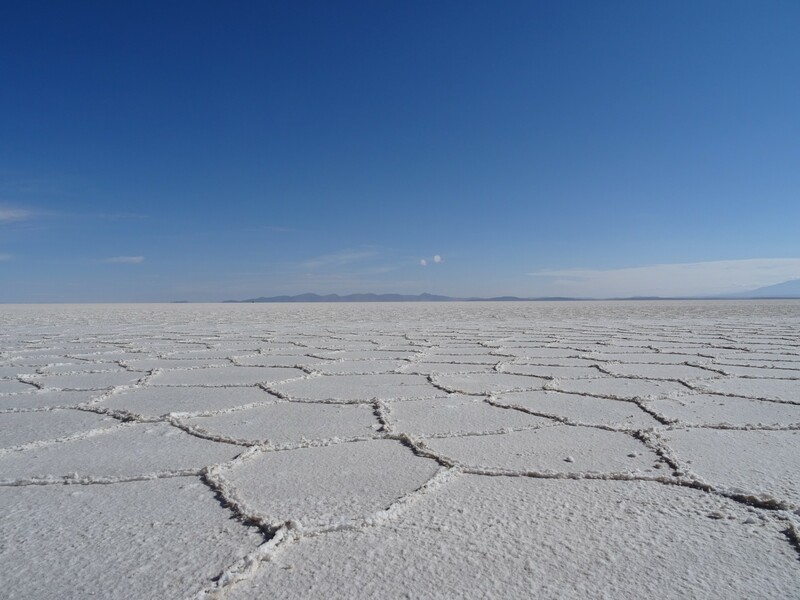 Toward the edge of the Salar, we visited some of the original salt hotels, also seeing some of the rather disappointingly small salt mounds – certainly at this time of year they’re not much to write home about. 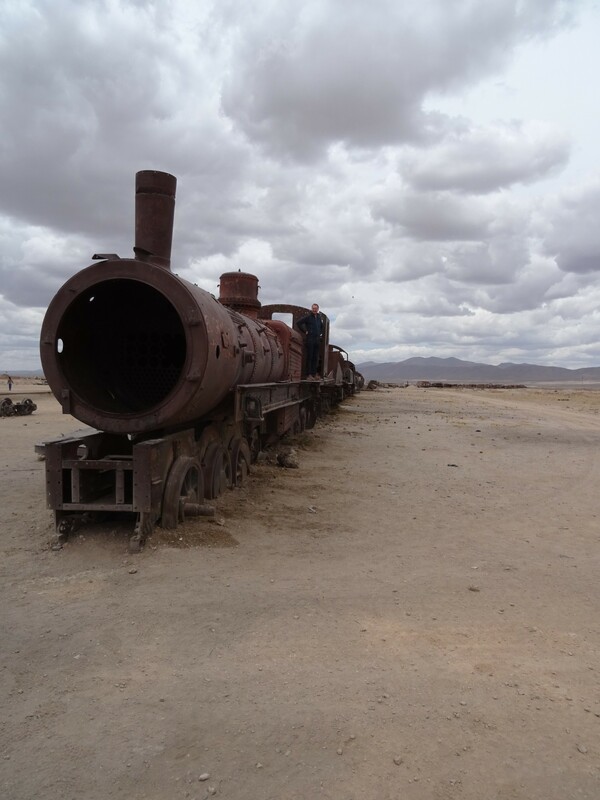 Our last stop was the train cemetery, outside of Uyuni. By this points the reality of the end of our tour had set in, so our visit was a rather subdued affair, but the abandoned state of the engines also gives off this feeling. Nevertheless, they’re certainly interesting, and its not clear why so many were left. We departed in separate directions, and separate methods. Miguel and Esteban would fly to La Paz, before heading down death road to Coroico, while Julia would also head to La Paz, only by bus. 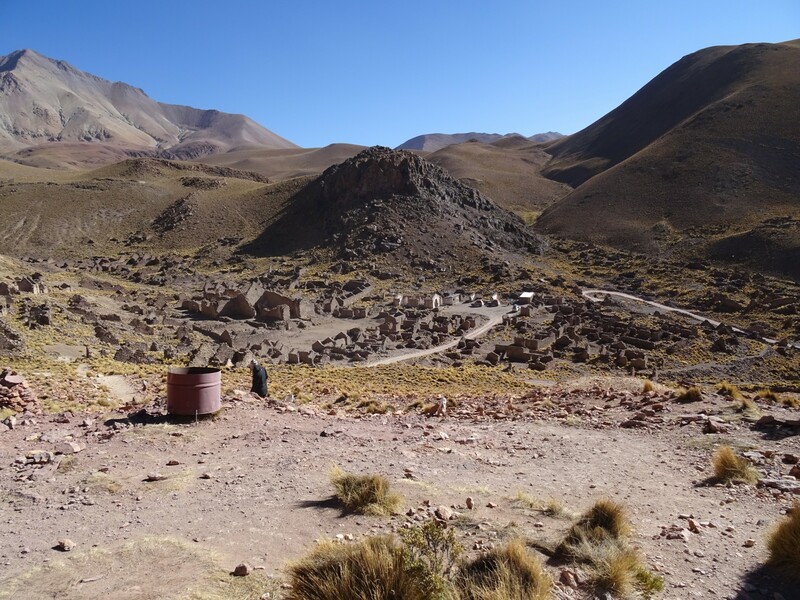 I set off for Sucre, via a very short stop in Potosi. Spanish lessons awaited. 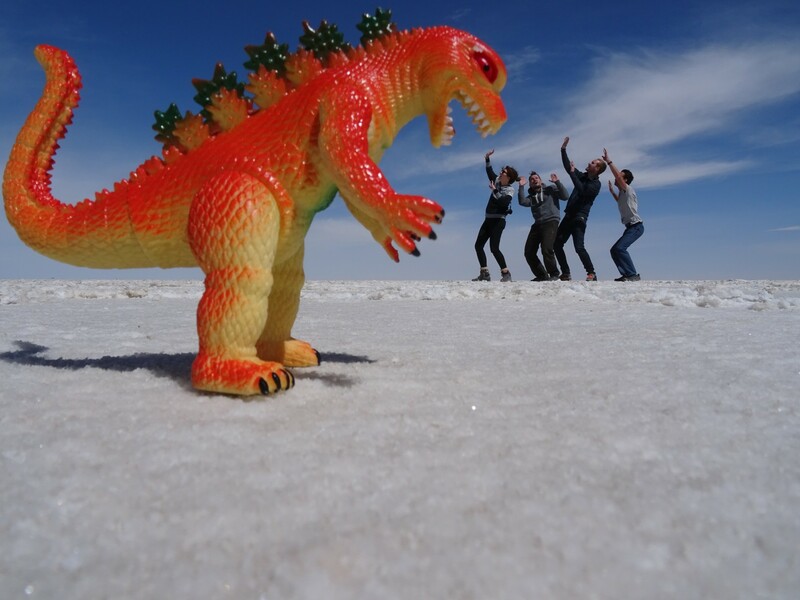 Hot Spring, Isolated Places, Lagoons and Lakes, October 2015, Salt Flat, Spectacular Views, Wildlife Galore. Bookmark.